Organizations facing multiplying security threats are increasingly required to manage, audit, and validate their enterprise cybersecurity to internationally accepted standards. 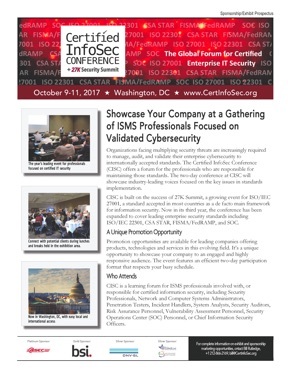 The Certified InfoSec Conference (CISC) offers a forum for the professionals who are responsible for maintaining those standards. The two-day conference at CISC will showcase industry-leading voices focused on the key issues in standards implementation. Now in its fourth year, the Certified InfoSec Conference will bring together professionals focused on the most widely-implemented enterprise security standards: ISO 27001, ISO 22301, CSA STAR, FISMA/FedRAMP, SOC, and PCI. It’s the leading forum for the global certified enterprise security community, including those who develop, assess, specify, support, and implement these standards. Promotion opportunities are available for leading companies offering products, technologies and services in this evolving field. It’s a unique opportunity to showcase your company to an engaged and highly responsive audience. The event features an efficient two-day participation format that respects your busy schedule. CISC is a learning forum for ISMS professionals who develop, assess, specify, support, and implement certified information security, including Security Professionals, Network and Computer Systems Administrators, Penetration Testers, Incident Handlers, System Analysts, Security Auditors, Risk Assurance Personnel, Vulnerability Assessment Personnel, Security Operations Center (SOC) Personnel, or Chief Information Security Officers. Includes: Premium leading sponsor billing on all conference materials • Opportunity to hang banner (up to 8’ x 8’) in registration area • Sponsor signage • One premium table-top showcase exhibit space • 1 page b/w ad in the conference guide • Four (4) complimentary full conference registration passes • One insert in conference handouts • Logo on conference web site. Includes: Leading sponsor billing on all conference materials Includes: One table-top showcase exhibit space • Three (3) complimentary full conference registration passes • One (1) insert into the handout materials • 1 page b/w ad in the conference guide • Logo on conference web site. These sponsorship opportunities are a great way to make a targeted, unique, and personal marketing impression on conference participants. Your marketing outreach begins with an established presence at CISC. Your showcase table top booth puts you in front of attendees, and your conference program listing lets them know how to find you and what you offer. All breaks, lunches, and receptions are held in the exhibition area--over seven hours of dedicated time. Setup is easy: Arrive the morning of the exhibition, and depart the next day. Full time booth exhibit staffing is not required, so you're not tied to your booth--attend conference sessions, meet with clients, or take a break. Reserve a booth space in the CISC showcase exhibition. All breaks, lunches, and hospitality events are held in the exhibit hall. The exhibition will take place Tue, Oct 10, 10:00 AM-6:30 PM, and Wed, Oct 11, 8:00 AM – 1:40 PM. Includes: Table-top booth space with 5’ x 30” high table, chair, and company ID sign. • One complimentary conference registration pass ($695 value) • Admission to all conference activities • Inclusion on email, web and collateral—over 420,000 impressions. The 24-page conference program guide is distributed to all conference registrants, and posted to the conference web site. One-Page Black & White Ad: $1200. Half-Page Black & White Ad: $750. Quarter-Page Black & White Ad: $400. Advertising Mechanical Requirements: 1 Page Ad Trim Size: 7 1/2” x 9 3/4”, Live Area: 6 3/4” x 9”; Half Page Ad, 7 1/2” x 4 7/8”; Quarter Page Ad, 3 3/4” x 4 7/8″” File Format: High-resolution PDF file required. Almost any high-resolution PDF file acceptable. Files in Adobe’s PDF format created from an Adobe application using the PDF/X-1a:2001 specification preferred. Typically, PDF files are created from Postscript files utilizing Adobe Acrobat Distiller, but PDF’s created from InDesign will work as well. Line Screen, Binding: 133 for 4/c ads, 280% maximum density, 120 for B&W and 2/c ads, 180% maximum density. Saddlestitch. File Submission Instructions: Email preferred. Send to [email protected] Files received will be confirmed. To Mail, send memory device to Cnxtd Event Media Services, 421 Seventh Ave. #1012, New York, NY 10001. To FTP: We recommend Hightail, a free online FTP service. Visit www.hightail.com for instructions. For assistance call 212-866-2169.